Let's face it, wrestling has had its fair share of goofy characters who were meant to be mean monsters and intimidate the fans and the baby faces. Zeus was meant to be one of those guys, but I always found the gimmick a bit laughable. Tiny Lister played the role of Zeus in the Hulk Hogan film "No Holds Barred." Lister had been in a few movies and TV shows prior to the No Holds Barred experience. If you haven't seen the movie, I would highly recommend it. It's a guilty pleasure, but I myself haven't watched it in years. Of course as a way to promote the film, it only made sense to bring Zeus in for a battle with Hogan that went beyond the movie script. I'm racking my brain, but I'm pretty sure the two never met one on one. 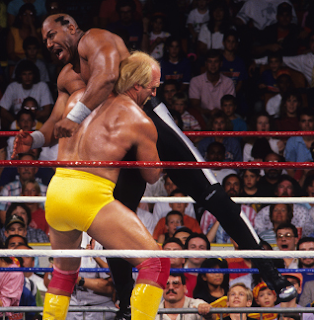 Zeus attacked Hogan in his debut during a match Hogan had with the Big Bossman. Then there was the SummerSlam 89 tag team match with Hogan and Beefcake facing Zeus and "Macho Man" Randy Savage. Of course the faces won. Then Zeus joined the Million Dollar Team at Survivor Series 89. He ended up being the first man eliminated after shoving the referee and getting disqualified. I'm pretty sure Zeus' final WWF match came at the end of the year as he and Savage teamed again in a cage match against Hogan and Beefcake. Shortly after that, he left the WWF and faced Abdullah the Butcher in a match in Puerto Rico. Zeus earned the distinction of number 500 in the first ever Pro Wrestling Illustrated 500. He reemerged in wrestling years later in WCW as Z-Gangsta in an effort to end Hulkamania. He failed again. As big, mean, and intimidating as Zeus was, the character never took off. I don't know that Lister ever wanted to be a full time wrestler and was likely full filling his obligations to Vince McMahon as a part of the film. Sadly, probably the scariest thing about Zeus was his abilities in the ring.